Tres Brazilian Cultural Centre is delighted to have the opportunity to hold their first group exhibition in the Signal Arts Centre, Bray with the honour of having, as guest speaker, the acclaimed visual artist Brian Maguire. “Facets of Brazil” will showcase the artwork from ten Brazilian artists. 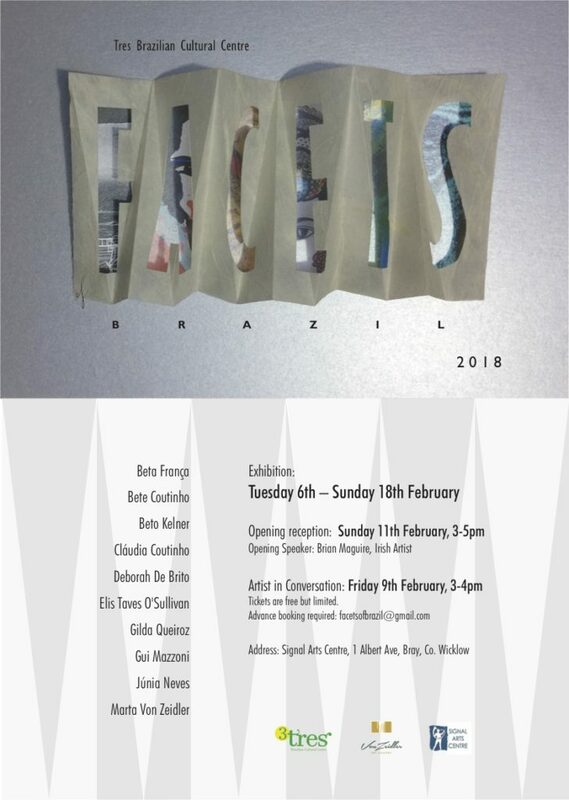 This is the first Brazilian group exhibition in Ireland and, through their work, the artists involved are helping to support the work done in Ireland by the Tres Brazilian cultural Centre. The contemporary work covers diverse styles from different regions of Brazil and emphasises the mixture of work produced through different media types. Featured in this exhibition are photographers Bete Coutinho, Elis Taves O'Sullivan and Gui Mazzoni. Artists such as Beto Kelner, Claudia Coutinho, Deborah de Brito, Gilda Queiroz, Junia Neves and Marta von Zeidler will be representing different approaches taken through modern painting and Beta França will be showcasing sculpture. During the time of the exhibition artists will talk about their work and join a discussion panel. If this interests you, be sure to follow the Tres Brazilian Cultural Centre on Facebook.